My daughter asked when I was planning to go shopping this week – I usually go on Friday, but this week we seem to have a lot of food. Now that I have sorted the store cupboard, we have plenty to keep us going. I only intend to buy a few bits such as milk, bread, cat food and maybe some chicken. She constantly complains that there is no food in the house. What she means is that there isn’t loads of rubbish that she can eat with no effort. I try to guide my daughters towards sensible eating, but it is a struggle sometimes! So I need to make sure there is some easy food that keeps us within budget. 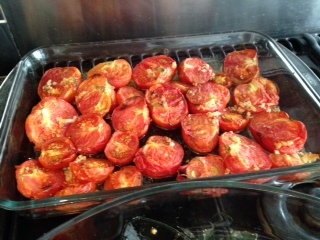 I began my day by putting 2 and a half kilograms of tomatoes on to roast with some olive oil and garlic. Whilst they were cooking I made porridge for everyone and touched up my roots – I don’t like to admit to going grey just yet. My hair costs hardly anything to do. I could spend £50 at the hairdressers having it coloured, but instead I mix up half a box of dye and brush it on myself. Yesterday in Boots they had my usual colour at 3 boxes for the price of two – so £12 for 3. These will last me at least 8 months. I intend to call the local college this week to book myself and DD3 in for a cut and blow dry each. This will cost about £8 each. Hair sorted and myself showered and dressed, I used the tomatoes to make a big pot of tomato and barley soup (determined to use up those store cupboard supplies!) 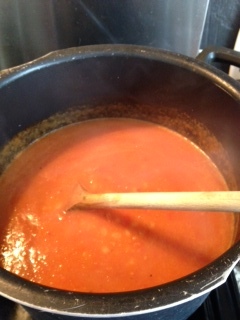 and a smaller pot of roasted tomato sauce for the freezer. So that was lunch sorted for the next few days! As I grew the tomatoes, the cost was minimal. More frugal steps. I gave the house a thorough clean, including the student’s room. I don’t have one due until next month, but it will be one job less to do when she comes. This is an important source of income for me, so I have completed a form for a different agency today as well. They find placements on a slightly longer term basis. I think it is unlikely I will get any more students until the Spring with the agency I use currently. I then made some courgette fritters for our tea, using up some from the garden – we had them with sausages, but I would be happy to have them as they are. I used some of the tomato sauce I made this morning with them. I have spent the past hour checking my bank statement to see how the budget is going and to make sure there is nothing amiss. I have also changed energy supplier – hopefully now that First Utility have resolved our argument this will go through OK. I decided on Good Energy. They aren’t the cheapest, but they come highest for customer satisfaction and use 100% renewable energy. After my nightmare with First Utility, getting a decent service is my top priority. Frugal steps towards tomorrow’s meals: I have taken some plums out of the freezer and tomorrow I will make a plum crumble using the super cheap crumble mix I bought from Approved Foods. This should stop the troops moaning and keep them happy!! If I get time I will make a victoria sponge for the week as well. I have also washed and hung two lots of laundry. One lot dried outside, but it clouded over and I thought it might rain, so the other is drying inside on the clothes horse. No tumble drying for me – far too expensive!! So, a day of lots of small frugal steps. This is why I love weekends and I can potter and get a bit of control. What have you managed to do to save money today? I too use the local college for hair cuts! I’ve used them for cuts as well as a colour which I was really pleased with! Kids who complain there’s nothing to eat in the house here too! 🙁 So glad it’s not just mine! You are very well-organized woman. Hugs from sunny Bytom. your tomato soup looks fantastic. i made a big pot tomatosauce today. 1 streuselkuchen and 1 apple cake with streusel.